I have had a very long and very stressful day that began with me missing an interview for a project and ended with me accidentally getting off a train in the Bronx instead of Manhattan. This page called for some hair art, so instead of making myself bald, I went searching for hair on my rug. I sit on an ottoman on top of said rug to get ready every morning, so there’s plenty of hairs chilling in that part of my room. I taped a few pieces here without really thinking about it to much and this is what that mess created. I don’t know what it is either. Lucio Fontana was an Italian painter who was born in Argentina. He was famous for making art that featured multiple slits or slashes. I don’t think I did too badly here. 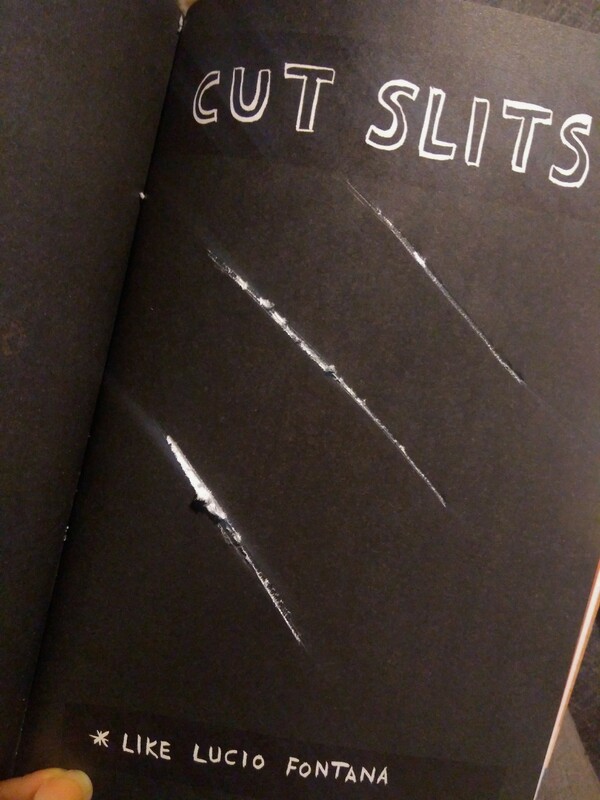 I made my slits using a pair of scissors. Since I didn’t want to make the slits go through the to the other page, I didn’t press as hard as I could have, but still, not bad. 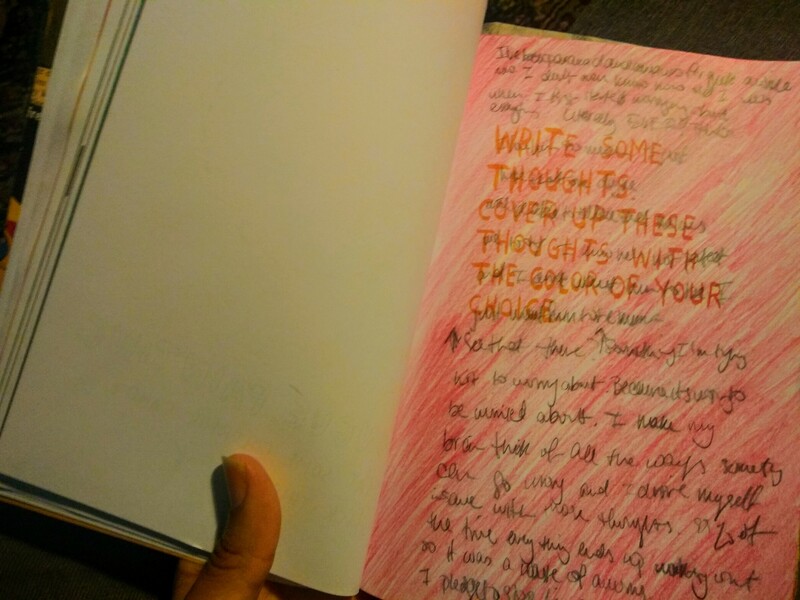 For this page, I was prompted to write down some thoughts and color on top of them. I’m assuming the color was supposed to make the thoughts unreadable, and therefore private, but we all know I can’t press down hard while shading. 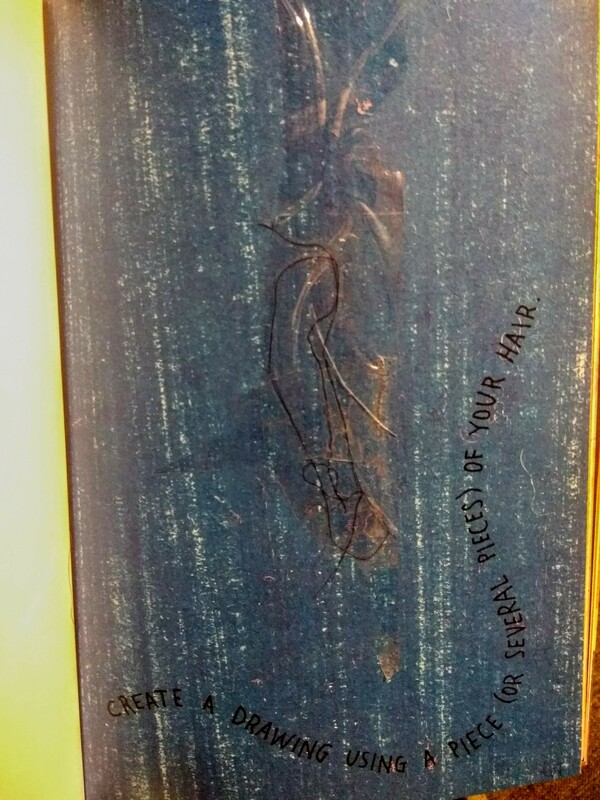 I wrote really sloppy anyway, so I doubt anyone will be able to tell what was actually written. I wrote in pencil, and the color I chose to cover this page with is pink, but it looks a bit red in the photo. See you next week with some more pages!